My company is Stuart J. Enterprises Ltd. and I am Robert Léger. I have 45 years of riding experience. 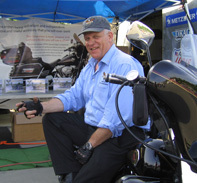 After loosing a few good riding buddies and a few close calls, Motorcycle Safety became one of my top priorities. I feel that proper maintenance of motorcycles is as critical as the maintenance of airplane. To me there is nothing more important than your motorcycle tires. And tires are the simplest and most economical part you have on your Motorcycle to maintain. All it needs is air. Here is how the idea started for the onboard tire compressor project. My wife and I had just came back from a 30 days motorcycle trip back in July 2001. We clocked over 15,000 km (almost 9320.6 miles!). We rode our new Ultra all the way to Newfoundland and followed the East Coast to Boston. It was a trip of a lifetime. The only problem I had was, I like to check my tires every morning while the tires are cold. On a long trip Motorcycle tires always seem to loose a little air especially tubeless tires. Finding a service station that has a good air compressor with the proper fitting is hard to find. The small 12V handy pumps are inconvenient to use and it don't really work too well after 20 to 30 psi . Before starting off on our trip I purchased a few things and a $59.00 tire pump. Every time we would break camp, I noticed my handy pump a little further down from the camp site. My wife was hoping we would forget it. She really hated that thing. She kept complaining about it taking the room of her make up bag. Nag Nag. "When did you ever have a flat tire", she would say. Besides the one to come later, in my 45 years of riding I only had one flat tire. That was back in 1970 with my old 1947 Knuckle Head. That is a flat tire I will never forget. I was sure that day was going to be the end of my riding career. It was a hard way to learn a lesson. Since that day, I always keep good rubber and check my tires daily. One low or flat tire is one too many. My Dad always warned me about the condition of my tires. When you're young, you don't take advice too well. My dad was a dispatch rider on the front line in World War 2. He rode a Harley Flat Head. He was one of the best Motorcycle rider I ever known. This was a feature story in the Canadian Hog Tales Fall 2004. I wanted a compressor that would not take any room from the luggage area. That would be powerful enough to put air in my tire fully flat in less than 5 minutes. That would not kill my battery. If the tire is at 20 psi it would still be able to inflate to 50 psi. Be easy to use and quick. Never ever need to look for a service station for air. No need for your tire gauge We have a built in precision pressure gauge attached on the filler hose. Life time Unconditional Warranty on our part # 7867 mounting bracket. With the Savior 250PSI; you will be able to keep your tires inflated at the proper pressure. You can also use the Savior 250PSI to inflate air mattress and soccer balls and toys. In the case of a flat tire, a quick patch job and re inflation of the tire using the Savior 250PSI and you will be on your way again. This revolutionary design uses custom made brackets and components to ensure a truly custom fit. On a remote camp ground near Cow Head Newfoundland we got a flat tire. I picked up a 2" aluminum-roofing nail. The $59.00 pump did the job and helped us get back on the road to a shop about 150 km . My opinion is if you pull into a tire shop with your motorcycle on a flat bed tow truck. Your negotiation power to get a good deal on a tire is about zero. This is where being an independent and self-reliant biker pays off. Although the pump worked we still had some problems. The cigarette lighter on the Ultra is way down on the left side of the inner fairing of the bike. First thing that happens the handlebars will always turn to the left when the bike is resting on the jiffy stand. There is no room for the pump cigarette adapter to clear the gas tank. First thing that happened was the adapter hit the gas tank and dented it and the wire broke. Quick fix with black electric tape got it running again. It took a long time to get air in the tire and I was draining my battery. So I started the engine to keep the battery charged. The electrical wires for the pump must pass over the bike because you're filling the tire from the right side of the bike. The wire touched the hot exhaust pipe and shorted and burned my fuse. Again one more quick fix with black electrical tape and replaced the fuse. I was thinking with all this frustration in this day and age there must be a better way to do this. I was always told " If there is a will, there is a way". I searched the web sites for a built-in air compressor with no luck. Nothing even came close to what I had in mind. So I decided to remove the fairing and have a look for myself. The dealer was right it was going to be a real challenge to be able to install a tire compressor in such a tight spot. I notice on the right side under the speaker that the mounting bracket was broken. I remove the bracket and that is when I realized, if I modified a replacement bracket and designed it to hold a tire compressor it would probably work. First thing I did is to remove the plastic housing from the compressor that I had used on the trip to repair my tire and see if the compressor would fit in that spot. No luck it did not fit! I went out and purchased compressors in every price range and style. They were all similar. I found one that fit not too badly.. But I had the same problem I had experienced on the trip. It would take a lot of energy from my battery. I could not put more than 20 psi and if the compressor was not running and the hose was attached to the tire it would actually bleed the air from the tire. It took up to 20 minutes to reach 20 psi. After 5 years of research and development. We tried and tested different motors and seals, valves and heads. We finally made a compressor to comply to all six of the criteria I mentioned earlier and more. To equip it with a Powerful 12 volt motor with the torque necessary to get 50 psi in no time and not drain the battery. No need to start the engine to charge the battery. Good quality piston seals to last over 500 hours of continue use over 20 years of normal motorcycle use. Cooling fins on the cylinder head to keep the cylinder cool. Good quality valves to keep air from bleeding from the tire. Giving it a precise air measurement for checking tire pressure. Good quality rubber hose. Will not get hard in cold weather and crack in the sun. Pressure relief valve for safety set at 60 psi. with a precision 60psi gauge comparable to any professional gauge you would find in a technician tool box. We designed the mounting bracket with no sharp bends. This will improve the life and will help resist cracking with the vibration. After extensive testing we decided to offer a life time unconditional warranty on the bracket. All the compressors must exceed 200 psi in test before final assembly and packaging to assure quality performance & workmanship.